Beauty radiates from the inside out. That's what I always say. You know what I'm talking about. An hour stuck in a broken down elevator with the most beautiful specimen you've ever laid eyes on and one that wasn't so fetching at first glance could leave you feeling exactly the opposite once the repairman has done his job. There's been many a time when someone opened their mouth and instantly turned ugly. But there has been an equal amount of times when someone has opened their minds and transformed to stunning. The same thing can be said for many things. This bread included. When it bakes, it doesn't rise and form a dome like you may expect. Nope. Instead that awesome topping you've covered the batter with sort of buckles into the center. 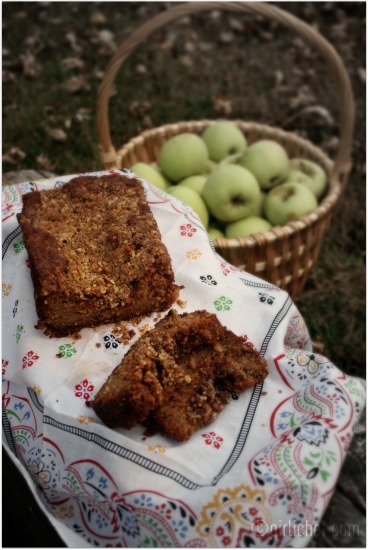 The bread itself is laced with apples and spice with little nutty surprises...and it is oh, so moist. 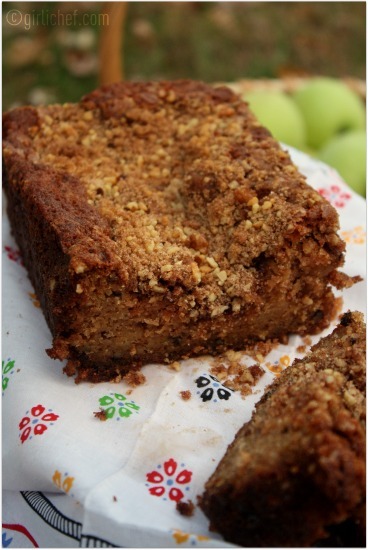 The crust on the top is crunchy and crumbly and absolutely blissful. I would definitely choose to spend time with it. As a matter of fact, I ♥ it. I wanted to slink off into a secluded corner and be naughty with it. Wrap it up in a towel and share the beauty next time you go visit a friend. 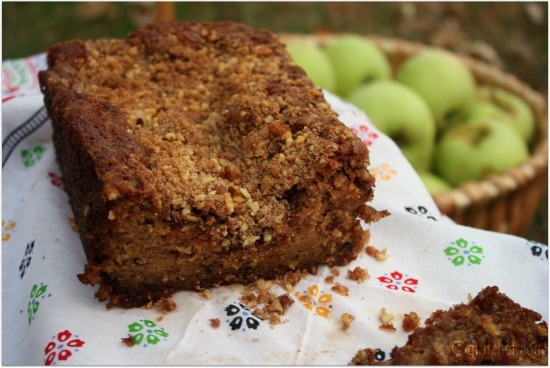 This super moist quick bread with a crunchy top is laced with apples, nuts and spices. Preheat oven to 350° F. Line an 8 1/2" x 4 1/2" loaf pan with foil or parchment paper, leaving an overhang that you can use to easily lift the bread out once it's done. Cream the butter and sugar until fluffy. Beat in the eggs and vanilla. Sift all of the dry ingredients right into the bowl and mix them until just combined. Stir in the grated apples and walnuts. Pour and scrape the mixture into your prepared pan. Combine all of the topping ingredients together and then scatter them as evenly as you can over the top of the batter. Slide into the preheated oven and bake for ~45 minutes. Warning: your house will smell heavenly! Check the bread after 30 minutes or so and cover the top with foil if it seems to be getting too brown. It is finished when the top is crusty and a toothpick inserted in the center comes out clean. Let cool slightly before lifting your bread out of the pan using the excess parchment or foil. Let it cool for as long as you can bear it before slicing. Our theme at IHCC this week is From the Orchard...and did you know that October is (among other things...) Apple month?